We know that nosebleeds are a side effect of blood thinners. Lucy had one that lasted for almost 45 minutes. She had another this morning that stopped in about 10 minutes. We arrived at Fairview Southdale IV Therapy at 7:30 am for her transfusion. The type and match took a little longer than usual, so her transfusion started at 9:00 and finished at 12:45. She is still extremely tired. Last night she had problems sleeping and she woke up several times. Now she’s home, warm, fed, and relaxing. Her leg isn’t quite as sore as yesterday and the swelling has abated somewhat. Lucy’s next blood test is Monday afternoon. There may be no updates until then. In the meantime, give your loved ones hugs from us, and thank you for your support! 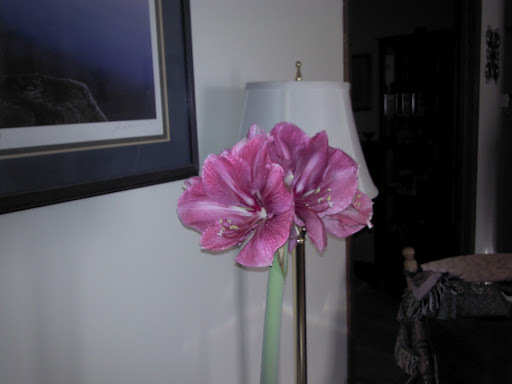 Lucy’s other amaryllis opened while she was in the hospital. There are six flower on the stalk. 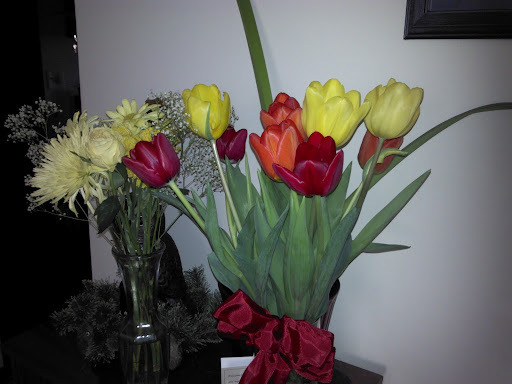 I completely spaced out mentioning the tulip bouquet Lucy received from Annette and Al on Tuesday. Mea maxima culpa! Annette and Al own Carver Country Flower and Gifts in Carver. Tulips are so cheery and get people thinking about spring. 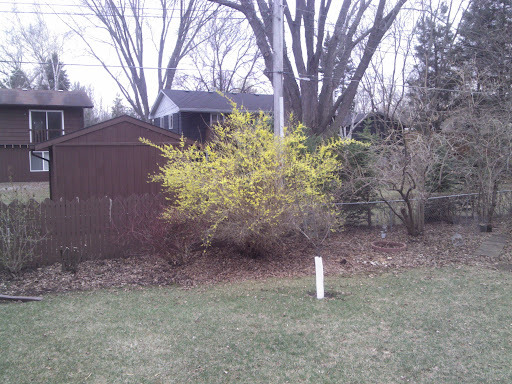 Even though we have had an unusually mild winter in Minne-snow-ta, it will be nice getting back into the gardens soon! This afternoon she had her blood drawn to determine if her Coumadin dose is still effective. She now has an alternating daily dose of 5 mg and 2.5 mg until Monday. Next week is booking up quickly: Monday is her next blood work to see how well the Coumadin dose is working, Tuesday is the PET scan, Thursday is her appointment with Dr. Boente and Friday is her appointment with Dr. Thurmes. As far as we know she will get her next Alimta treatment on Thursday. We take simple things for granted. Our bodies are amazingly complex bio-mechanical wonders governed by amazingly complex electrochemical networks. Nerves trigger muscles, muscles and connective tissues move joints, joints move limbs, limbs move the body. (Anyone who has studied anatomy or kinesiology in detail will notice this is a simplified 50,000 foot overview.) Lucy’s leg is looking less swollen and the redness is slowly turning pink. She still has some stiffness in her ankle and finds relief when she can prop her leg up. She can manage a few steps without the walker and her right ankle is more stable because of some regained flexibility. The pain level is also subsiding. She is hoping to be cleared to return to work a week from Tuesday (her company observes the President’s Day holiday on the 20th). There probably won’t be an update until Monday. Until then, thank you for taking the time to read this and showing your support for Lucy!